I collected stamps as a kid. I loved the colors and the countries and the little bits of art they carried with them on their journeys. My postal issuing authority is an imaginary island nation called Craneland. It's located in southern Lake Erie, near the other islands owned by the US and Canada (Pelee, Middle Bass, etc). It's similar to the other Lake Erie islands: there's a winery located there, a bird sanctuary, farmland, several marinas, etc. It's named after the rare Blushing Crane which makes its home on the island. 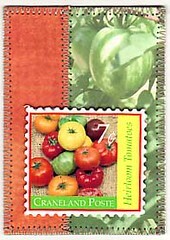 Along with tourism and fishing, one of the main sources of income for the island is the postage stamps they issue. The most recent one (above) celebrates one of the pleasures of late summer, the homegrown tomato, specifically an heirloom variety. I might just make fresh tomato sandwiches (thick slices of homegrown tomato and mayonnaise on good bread) an official national dish... yum.